Momas and Dadas: New Genres Project House welcomes artist-in-residence, Jevijoe Vitug! Meet & greet resident artist, Jevijoe Vitug this summer at Momas and Dadas: New Genres Project House. 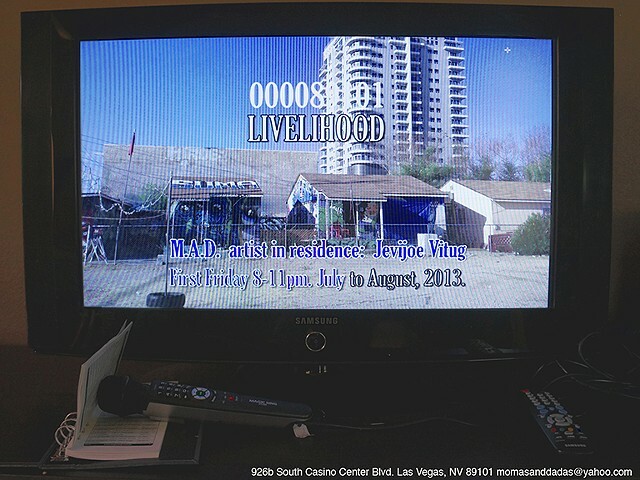 The public is cordially invited to his “Livelihood” open studio event, this First Friday, July 5th from 8-11pm in Downtown Las Vegas. Inspired by Warhol’s “Factory”, Vitug has coined the term, “Livelihood” as the name of his work space. According to the artist, his studio is a life support where, it is not an ideal place to earn a livelihood, yet it is a basic necessity of an artist’s life. For the Momas and Dadas Summer Residence Program, Vitug will re-create his “Livelihood” studio and reveal many of his daily rituals such as, singing karaoke in between painting sessions. He will also present his latest body of work entitled “Neon period”, a series of representational paintings, depicting the city of Las Vegas and its people, as a manifestation of constant reinvention. Jevijoe Vitug is a New Genres artist living and working in Las Vegas, Nevada. His art practice includes performance, site-specific projects, curating, painting and often involves notions of survival intertwined with reinvention and interconnectivity. Vitug relocated to Las Vegas in 2009, after studying New Genres at the San Francisco Arts Institute, and has since been actively involved in the local Las Vegas art scene. He co-organized the 2012 London Biennale Satellite event in Las Vegas, and in addition to Momas and Dadas, 2013 Summer Residency Program, Vitug is currently working on a project titled, “Re:Source, a non-for-profit initiative dedicated to archiving, research and development of local resources, and art making. Momas and Dadas: New Genres Project House, short-term residency program provides guest artists with a space and the necessary infrastructure in order for the participants to carry out their projects while investigating and challenging the parameters of performance, video, sound, language and technology. Guest artists are encouraged to perform collective research, including drawing of parallels between current performance and social practices and attempting to locate them within historic, economic, sociopolitical, and aesthetic contexts. Exhibitions of various guest artists’ work provide a springboard for discussion of theory, practical application, and critical thinking, in both historical and contemporary terms.